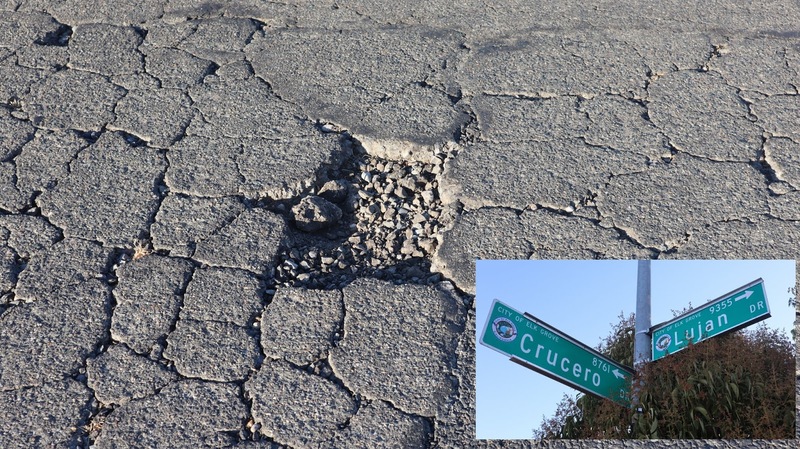 In what can only be characterized as an embarrassment for the Elk Grove City Council and their lack of attention to crumbling infrastructure within older neighborhoods, an Elk Grove resident presented the five member council a large piece of broken asphalt found on a city street. In a presentation during the public comment portion of the Wednesday, September 28, Elk Grove City Council meeting, Elk Grove resident Lynn Wheat presented council members a large piece of asphalt found on one of the city's crumbling streets. After her testimony Wheat identified the location of the pothole as Lujan Drive and Crucero Drive, in one of the city's oldest neighborhoods west of Elk Grove-Florin Road and south of Bond Road (see map here). Wheat noted that the city continues to neglect infrastructure in the city's older neighborhoods while taxpayer money that benefits new development is being spent to expand the city. "Older neighborhoods might not pay the excessive Mello-Roos fees of other areas, but they are neglected as we continue to expand outward," she said. "And look to take $5.5 million out of general reserve fund budget, to fund infrastructure into new areas." Noting she discovered the large pothole while on her way to pick up some take-out pizza, Wheat said given the city's neglect of this older neighborhood, she came upon the idea to apply with Dominos Paving for Pizza program. "I nominated our city of Elk Grove, in their paving for pizza program, because they don't want to see their pizzas' damaged on the way home," Wheat said. Following her comments, Mayor Steve Ly asked Wheat to let Public Works Director Robert Murdoch know the location of the potholes so they can be fixed. The timing of Wheat's comments are not without irony given the big celebration happening today with the opening of the new Costco store on Elk Grove Boulevard and Bruceville Road, that was aided by an $8 million taxpayer incentive to Pappas Development, the developer and owner of the new store. As part of the grand opening ceremonies, the city of Elk Grove's director of innovation and planning, Christopher "CJ" Jordan gushed about new projects underway to KCRA. Jordan made no mention of improving crumbling roads, or what innovative long-term plan he has developed or is in the process of forming for presentation to the city council, to pay for annual road maintenance shortfalls estimated at $4 million. While Jordan gushed about the city being "under construction," as reported in 2016, the city public works department has not addressed this neighborhood. Pretty sure Councilman Suen said a few months ago that the city was not going to spend general fund money on street improvements for areas that are not paying supplemental tax assessments. So to those freeloaders, I would say, keep paying your property taxes and gas tax, and welcome to South Highlands!